Calved June 1st, 2018. He’s a pistol! SHORT MORT, is the smallest bull we have ever seen. He should be presented to the Guinness Book of World records. He was only 25# at birth and could walk under the Mini Dairy cattle displayed here. Many of our Miniature Registered Herefords are purchased for pets – mini cattle so small and docile that they are safe for supervised children to be around. They can have life spans of upwards to 18 years. They can be purchased from us as they become available. Contact Us now for availability. Every year we have male calves that are not selected for breeding stock. Yes we have a stringent selection process, and that’s why our breeding stock is sought after world-wide. These calves are neutered and sold as Pet Mini Cows. The full vita of each Pet cow is available just like the registered stock. 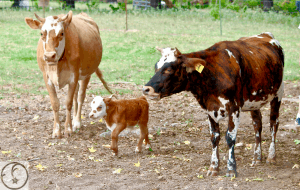 These calves are halter broke( walk with halter) and friendly, we consider them excellent for therapeutic value. 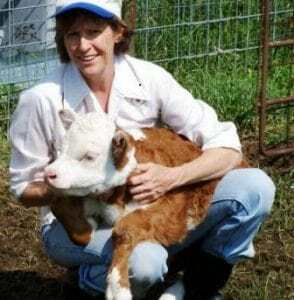 If you’re looking for a Pet Mini Cow for a backyard pet, Petting Zoo, or a mini steer to ride, let’s talk about Falster Farm genetics: no order is to to large or too small – you will recieve our fulll attenion and appreciation. 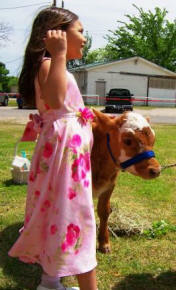 We have other wonderful mini pet cow candidates, feel free to give us a call. Yes you can get here from there. Located mid way between Dallas and Shreveport, some 46 miles North of Tyler, Texas. Private Airport Available. Gaining Ag Exemption with Mini Cattle is our Stock and Trade – please come see us, share in our small family farm hospitality.